When to use: If you think the market will go up, but with limited upside. Good position if you want to be in the market but are less confident of bullish expectations. You’re in good company. This is the most popular bullish trade. of spread. If put-vs.-put version used, break-even is at B – net premium collected. Loss characteristics: What is gained by limiting profit potential is mainly a limit to loss if you guessed wrong on market. Maximum loss if market at expiration is at or below A. With call-vs.-call version, maximum loss is net cost of spread. 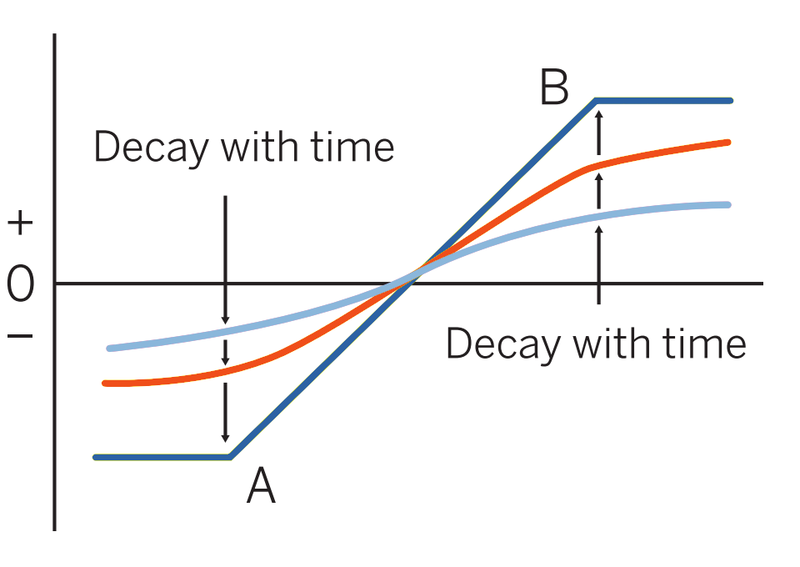 Decay characteristics: If market is midway between A and B, little if any time decay effect. If market is closer to B, time decay is generally a benefit. If market is closer to A, time decay is generally detrimental to profitability. 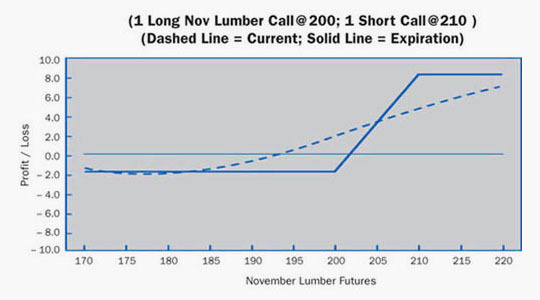 The trader feels bullish on Lumber, but volatility is in question. He could try futures as an alternative, but wants the comfort of a limited loss position. He decides on a bull spread with the higher strike written at the top of his expected trading range of 210. Loss Risk: Limited to premium paid. Losses increase below 201.60 to a maximum loss below 200.00 of 1.60 ($240). Potential Gain: Limited to difference between strikes less debit paid (10.00 – 1.60) 8.40 ($12,600). Gains mount above 201.60 with maximum profit at 210.00. Volatility changes affect this spread very little. Therefore, if the trader has an opinion on volatility, one of the other strategies may work better. Check the next page for follow-up strategies.